Derek (my boyfriend) is dressed at Ken. I (Kelsee) am dressed as Barbie. We had the idea to dress up at the classic Barbie dolls but I felt like we needed something more. So I decided to make Barbie boxes. I found two medium sized boxes from U-haul and cu them into a Barbie shape box. Then I found pink spray paint at Walmart (5 cans) and spray painted the brown boxes. Then found cute writing on google that said "Barbie" and "Ken" and super sized them. I made cut out of the starts and laminated everything on the box. I put the stars all over and on the back put barcodes to make the boxes seem real. I then found a cute saying on google that says "He's the Ken to my Barbie." 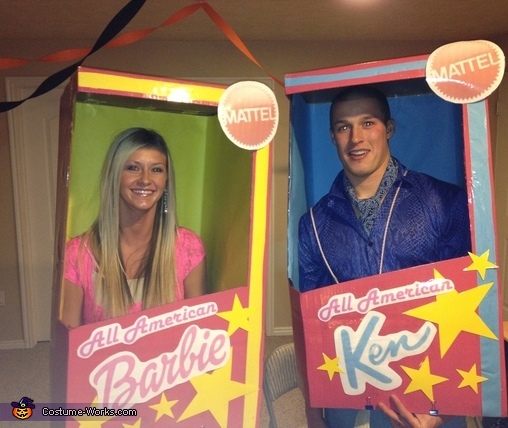 The final stage was finding the perfect All Amercia Barbie outfit.